Saturday March 1st 1924 I wrote to Hattie and Millie Byington. we were in town most of the afternoon. I knit the bag at reading room. Sunday March 2nd 1924 We went to S S and church and had dinner in town as we always do. After got home I began to write letters. There was six of them, to Ida, Mattie Stitt, Tishie, Sue & Sallie, Gertrude Mitchell & Mrs Dunlap at Daytona B-- Monday March 3rd 1924 I knit in forenoon. We went to town after dinner. I was at Pickens awhile. Then called at The Lexington to see Mr & Mrs McBride. A letter from both Ott & Hattie in regard to what I said about furniture for William & Mary. I got my reservation today for March 15 from Jacksonville. Tuesday March 4th 1024 I knit some and wrote to Ott, William & Mary, Mrs Ben Price, Joe Williams & Anne Dudley at The Beach. We called on Mrs McBride in afternoon. In the evening went to Orange City to an entertainment. weather fine. Wednesday March 5th 1924 I finished Rubys bag and got ready to send. Wrote to her and Hattie before noon. It is 5 years today since Mary Woolf was buried and 23 since we laid Bro Lee away. Spent the afternoon with Mrs McBride. Letter from Millie. Home in evening. 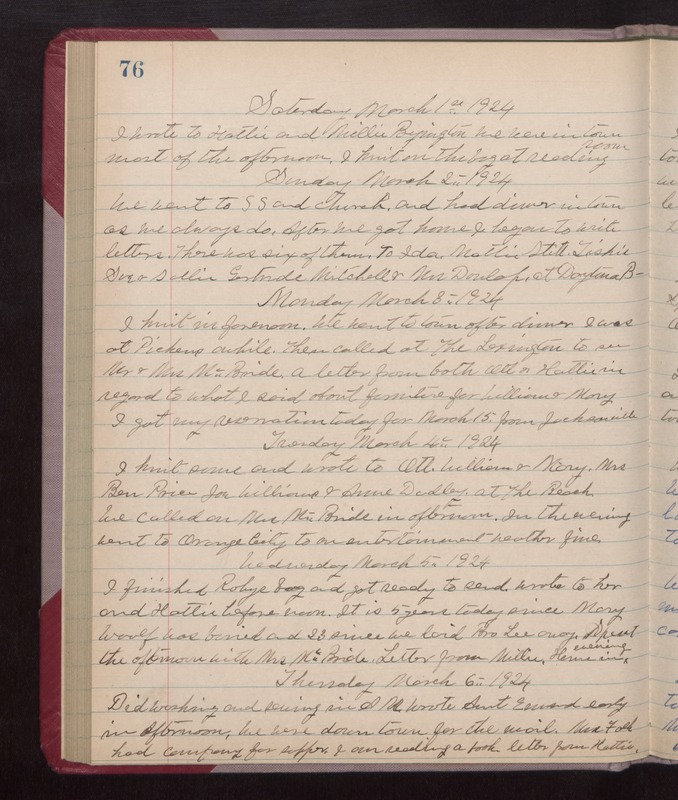 Thursday March 6th 1924 Did washing and sewing in AM. Wrote Aunt Emma early in afternoon. We were down town for the mail. Mrs Falk had company for supper. I am reading a book. Letter from Hattie.